Can you imagine seven prominent men of Boston or Denver banding together, leaving their homes and professions, and going into solitude for a life directly given to God? That is what happened in the cultured and prosperous city of Florence in the middle of the 13th century. The city was torn with political strife as well as the heresy of the Cathari, who believed that physical reality was inherently evil. Morals were low and religion seemed meaningless. In 1240, seven noblemen of Florence mutually decided to withdraw from the city to a solitary place for prayer and direct service of God. Their initial difficulty was providing for their dependents, since two were still married and two were widowers. Their aim was to lead a life of penance and prayer, but they soon found themselves disturbed by constant visitors from Florence. They next withdrew to the deserted slopes of Monte Senario. 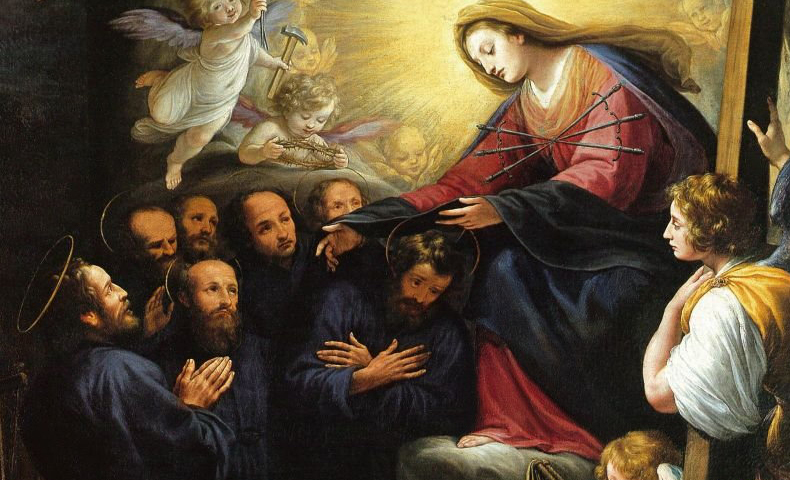 In 1244, under the direction of Saint Peter of Verona, O.P., this small group adopted a religious habit similar to the Dominican habit, choosing to live under the Rule of St. Augustine and adopting the name of the Servants of Mary. The new Order took a form more like that of the mendicant friars than that of the older monastic Orders. Members of the community came to the United States from Austria in 1852 and settled in New York and later in Philadelphia. The two American provinces developed from the foundation made by Father Austin Morini in 1870 in Wisconsin. Community members combined monastic life and active ministry. In the monastery, they led a life of prayer, work and silence while in the active apostolate they engaged in parochial work, teaching, preaching, and other ministerial activities. The time in which the seven Servite founders lived is very easily comparable to the situation in which we find ourselves today. It is "the best of times and the worst of times," as Dickens once wrote. Some, perhaps many, feel called to a countercultural life, even in religion. All of us are faced in a new and urgent way with the challenge to make our lives decisively centered in Christ.